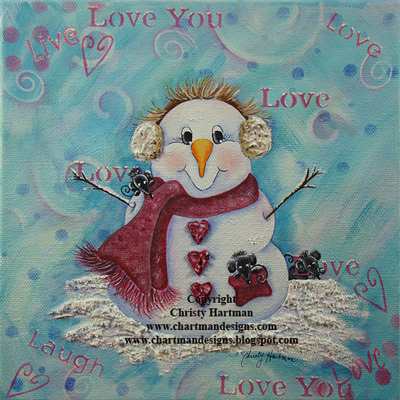 Isn't this little snowman adorable with his mice friends along for the ride? This project is painted on a 8"X8" Gallery Wrap canvas but could be adapted to so many different surfaces, wood surfaces, cards, scrapbooking pages, the sky is the limit. These canvases are available at your local hobby stores or even box stores. The background of this project uses a layered paint application which incorporates stencils into the background and is so quick and easy to paint. The snowman is also quickly painted using stippling for the bulk of his head and body. If you do not have the same stencils that I do then use different ones, it isn't necessary to use the same ones that I used, this is your opportunity to be completely creative and make this project your own.